If you have an outstanding leader in your unit or district that you believe of recognition for service at these levels, especially for the District Award of Merit, please complete and submit the requisite nomination forms by January 21, 2014 so the selection committee has time to review, discuss, and select recipients. 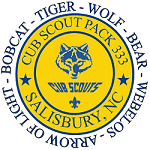 You may return these forms in confidence to John Barden via emailjobarden@bsamail.org or at the St. John’s Scout office. Please RSVP by Friday, January 31, to event chair James Wilkie (jwilkie@carolina.rr.com) or district executive John Barden (john.barden@scouting.org).